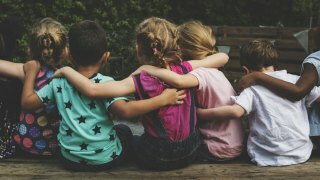 More than 1,100 communities will hold Awareness Day events around the country to bring attention to children's mental health, according to the Substance Abuse and Mental Health Services Administration (SAMHSA). In D.C., the Partnering for Health and Hope event will come to the campus of the George Washington University on Thursday, May 10 at 7 p.m. ET, hosted and moderated by NBC4's Aaron Gilchrist. NBC Washington will be live streaming the event in the video player below. App users can watch here. Families, youth and young adults will be able to ask questions during a virtual town hall format with agency personnel, health care providers and professionals who serve children. Experts, as well as family and youth leaders, will share evidence-based strategies to help children, youth and young adults who have experienced trauma. U.S. Secretary of Health and Human Services Alex Azar will recognize 18 governors' spouses, including six who will be at the event, with a SAMHSA Special Recognition Award for "their work to address youth mental health and promote trauma-informed care in their states," the organization said. Azar will also present a SAMHSA Special Recognition Award to the executive director of the National Congress of American Indians to recognized the trauma-informed work being done in tribal nations in the U.S. The event will be held at GW's Dorothy Marvin Betts Theatre, at 800 21st St. NW. Those wishing to attend in person may RSVP online here.